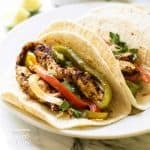 Sheet Pan Chicken Fajitas: turn your kitchen into a Mexican Cantina! 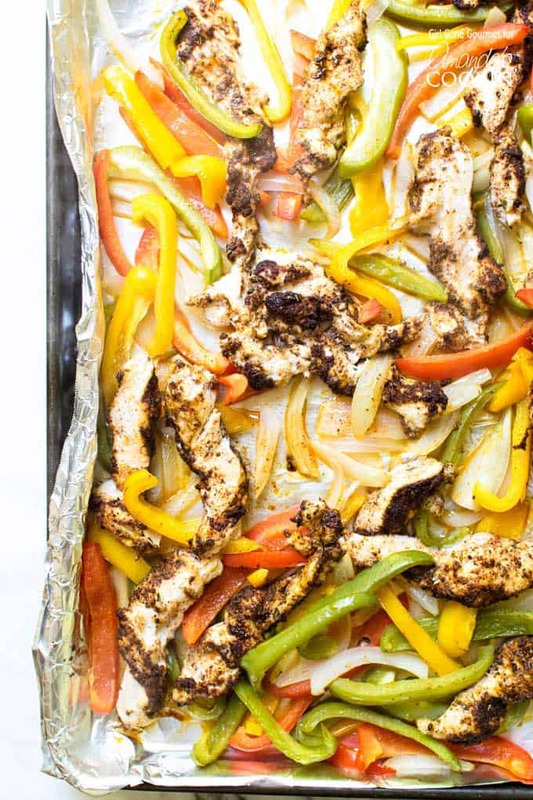 Turn your kitchen into a Mexican Cantina and make easy sheet pan chicken fajitas. Wrap these sheet pan chicken fajitas up in flour tortillas with a dollop of sour cream, a scoop of guacamole, and a drizzle of salsa. It’s so easy to recreate this restaurant favorite at home and it takes only 30 minutes start to finish! Similar in deliciousness is this Chicken Fajita Salad, and we feel you’ll love both versions! A great discovery in life is the realization that so many popular restaurant dishes are easy, and often times cheaper, to make at home. There’s no simpler dish than sheet pan chicken fajitas. I think the thrill of ordering it in a restaurant is the grand entrance it makes. Every fajita plate I’ve ordered makes it’s way to the table balanced precariously on the server’s tray, sizzling hot with wafts of steam left in its wake. 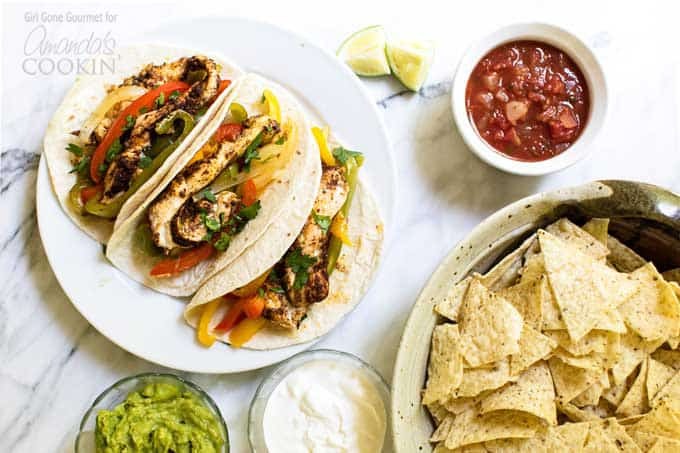 Chicken fajitas are always a spectacle and grab the attention of everyone within earshot. And so it was with that drama in mind that I tackled a homemade version of chicken fajitas. 30-minute sheet pan chicken fajitas. No reservations required. Want more easy chicken recipes? Be sure to check out my chicken cordon blue roll-ups, chicken and peppers on soft rolls, and my grilled chipotle chicken tacos. It all starts with the sheet pan. I lined it with tin foil and popped it in the oven while it was preheating so when the sliced peppers, onions, and chicken are placed on it, they emit that satisfying sizzle sound. The preheated pan also helps speed up the cooking process, which means dinner is ready to go after only 20 minutes in the oven. I’m sharing a simple fajita seasoning made up of spices you most likely have on hand already, but feel free to substitute your favorite pre-made fajita seasoning to make things even easier. When the chicken and peppers are ready, place the hot pan in the center of the table with tongs and let everyone build their fajitas family-style. It’ll make your kitchen feel like a beloved neighborhood Mexican restaurant. Boneless skinless chicken breasts are first pounded out which helps tenderize them and ensures even cooking, then sliced into 1-inch strips. I always use a plastic cutting board when handling meat to prevent cross-contamination. A simple fajita seasoning mix of garlic and onion powders, dried oregano, paprika, cumin, salt and pepper. Bell peppers. I like to use a mix of red, yellow, and green but any combination will work fine. Whether it’s Taco Tuesday or a Friday night in with Netflix these sheet pan chicken fajitas are destined to be a go-to favorite for dinner. Pair this meal with this Mexican Inspired Sangria for an even better Taco Tuesday experience. You may also love this mouthwatering Sopa De Fideos: Mexican Noodle Soup recipe, another authentic Mexican restaurant favorite! Another 30-minute recipe that will knock you into another dimension is this Sheet Pan Salmon Dinner with Lemon and Tarragon. It’s simple to make and bursting with flavor. Served up alongside roasted cauliflower and green beans, this dinner choice is one to be reckoned with. These sheet pan chicken fajitas are so delicious. 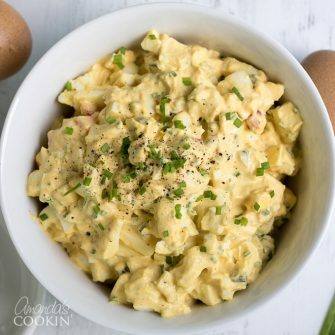 It's easy to recreate this restaurant favorite at home and it takes only 30 minutes start to finish! Pound the chicken breasts with a meat mallet until they are of even thickness. Coat the chicken with 1 tablespoon of olive oil. Mix the spices together in a small bowl and then sprinkle over the chicken in an even layer (both sides). Slice the chicken into long strips, about 1 - 1/2 inches wide. 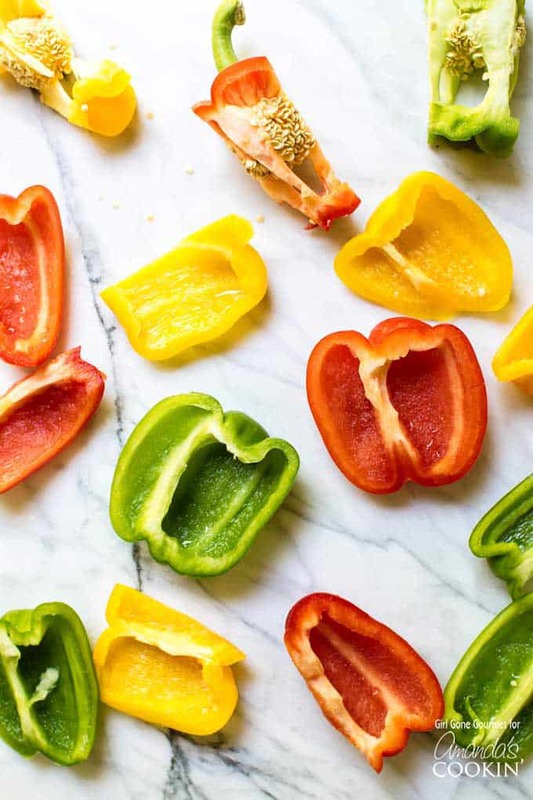 Toss the bell pepper slices and onions with the other tablespoon of olive oil. Remove the hot sheet pan from the oven and spread the peppers and onions in an even layer. Place the chicken strips among the vegetables. Place pan back in the oven and cook for 20-25 minutes, or until the chicken is cooked through. This post originally appeared here on May 26, 2017. These are amazing!!! Great flavor and so easy to prepare. We will definitely make these again!!! Is there any alternative option if you don’t have a meat mallet? These were perfect! Great flavor and foolproof method (my peppers always end up going limp when I cook them on the stovetop). 20 min cook time was spot on. Thank you so much for sharing! So glad you enjoyed them, thank you Tricia! Do you put the pan back in the oven after placing the chicken on it or you just heat it in the oven and cook out if the oven? It just seems like the pan will go cold trying to cook out if the oven. It doesnt say to place back though. Thank you this sounds delicious. Yes you put the pan with the chicken and vegetables back in to the oven. Yesss! LOVE a good sheet pan dinner- always has my back in times of need (and laziness). Can’t wait to try this one!